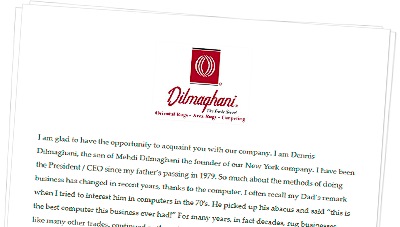 Mehdi Dilmaghani founded Mehdi Dilmaghani & Co. Inc. in New York in 1921. The Dilmaghani Company manufactures, imports and distributes thousands of handmade Oriental Rugs to dealers nationwide every year. Early on, our company established and maintained a renowned reputation for producing the finest Persian Kermans (Cyrus Crown® Kermans) available in the post World War I era. Our wholesale customers are located in major cities throughout the U.S. and, in many cases, continue a 2nd and 3rd generation association with Dilmaghani. Dilmaghani rugs are in the homes of notable dignitaries, politicians, entertainers, musicians, sports stars and businesspeople. Today, with Dennis Dilmaghani, Mehdi’s son, as president, Dilmaghani continues its tradition of producing its own rug designs and takes pride in using the best materials and workmanship in its products. Dilmaghani is also sensitive to the worldwide concerns about the use of child labor and requires its producers and weavers to provide certification that illegal child labor is not used in production of Dilmaghani rugs. The Dilmaghani family’s history and roots in the Oriental rug trade date back over 150 years to Kerman and Tabriz, Persia (now Iran). The family business was started by Mehdi Dilmaghani’s great uncle and, later, carried on by his father and uncle. In the early years of his business career in New York City, Mehdi Dilmaghani recognized the need to supply carpets which satisfied the taste and style of the American buyer. He introduced designs, colors and styles to meet the specific requirements of the American market and produced rugs meeting the highest quality standards in each facet of production to insure durability. 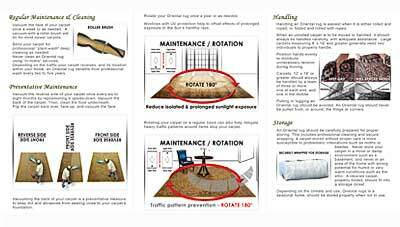 There are many different qualities of rugs made within any given weaving district. For example, the name “Kerman”, comes from the village, Kerman, in Persia (Iran). They, like other Persian design rugs named for villages or districts, encompass rugs of vastly different quality. The concept of quality includes not only the quality of the weave, but that of the design intricacy, the dyes (used to achieve certain color palettes), workmanship, the grade of wool (and other materials) and finish. The differences can be quite remarkable and account for a significant variation in cost of production and market price. Mehdi Dilmaghani decided to separate his better quality goods from common production by designing and weaving a royal crown emblem, encircled with a wreath, into the border of the carpet. This gave immediate recognition to his product and became an industry signature which signified a Dilmaghani rug – one of the best quality available. Dilmaghani subsequently registered the use and design of its crown with the U.S. Patent Office (1930) and trademarked “Cyrus Crown® Carpets” as its proprietary line of high quality hand knotted rugs. Throughout the 20th century, The Dilmaghani name in Kerman rugs was always synonymous with the finest hand-knotted rugs made in that area. Dilmaghani’s high standards (when other manufacturers disregarded quality concerns and produced for the mass market) contributed to the company’s success and reputation. Our company controlled every phase of raw material procurement – from the finest long staple wools to the most expensive and hardest to find dye-stuffs. We dyed our own wool, developed the most intricate designs, employed the most experienced weavers in the district and finished each rug within the Dilmaghani workshop. Aside from choosing the best materials, we inspected, supervised and carefully documented every Cyrus Crown® Kerman during the course of production. The industry marveled at the quality of our wool, the tightness of our weave, the beautiful detail of our designs, and the consistency and unusual quality of color in our dyes. Nobody achieved Dilmaghani’s level of perfection. Our rugs represented some of the finest Kerman pieces made in the early 20th century rug industry. Even U.S. Customs valued the Cyrus Crown® Kerman more highly than any other Kerman quality ever made. Many years ago, when US Customs assessed duty based upon quality, our goods were charged the highest possible rate! Our Cyrus Crown® Carpets withstand the test of time beautifully – far better than similar rugs. Our Crown rugs wear extremely well and retain their original appearance after many years because of their excellent quality. When washed professionally, our colors will remain fast and the wool will retain its original luster. Dilmaghani’s Cyrus Crown® Kerman inventory includes carpets from 40 to 60 years in age which have never been used. Finding new rugs carefully stored and maintained over so many years is most unusual. Imagine buying a 1945 Cadillac today, brand new, as if it had just rolled off the production line! Dilmaghani’s inventory of these rugs is limited and cannot be replaced. Production of Cyrus Crown® Kermans ceased in the early 1960’s due to management and manufacturing control problems abroad. Beginning in 1980, embargo restrictions prevented importing rugs from Iran. Over time, the value of the more desirable antique, semi antique and pre-revolution Persian rugs has been rising. Prices of such older pieces will continue to rise in comparison to newer goods not produced with careful supervision and quality control standards. Today, Dilmaghani continues production of Cyrus Crown® Carpets on the company’s master looms in India. The Cyrus Crown® line consists of a wide variety of original and new designs in several quality ranges. Most designs are immediately available from stock in standard sizes. Dilmaghani also provides a complete custom service. This includes custom producing any design, yours or ours, with respect to color, size and shape on our Cyrus Crown® Looms.